Click on the ADD TO CART button to start shopping. You will be redirected to the York University Bookstore Website to complete your order. One cinema-architecture responds to another as the nineteenth-century mansion of the heiress to the Winchester Repeating Rifle fortune haunts once again through the hallucinated images of American artist Jeremy Blake's Winchester Trilogy . Blake's invention of a new genre of art between video and painting--video projection as time-based painting--is the medium through which arah Winchester's mad architectural project (constructed to appease spirits killed by her family's manufacture) transmits its ghostly inheritance. 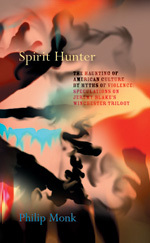 Spirit Hunter examines how its mythic haunting by violence reverberates today in America's wars. The book ranges widely through frontier myth, American foreign policy, technology, war, film history, psychoanalytic theory (Nicholas Abraham and Maria Torok's cryptonymy), and philosophy (Jacques Derrida and Emmanuel Levinas), as it weaves art analysis into the troubled history of a social artifact. As Blake tells his story purely through images issuing as haunting from the architecture of Winchester house, Spirit Hunter pursues its speculation on the secrets Sarah Winchester shielded through her fabled mansion into the image itself to question whether she was hostage to her haunting or to national myth. memory and for his deadpan manipulation of cultural products ­ feature films, newspapers, and magazines. Essays by Alexander Alberro and Aaron Schuster examine Bismuth's work in all media, with special focus on works from 2001–2003 that were featured in his exhibition at the Art Gallery of York University. This two part catalogue, which includes essays by Sally McKay, R.M. Vaughan and stories by Sheila Heti and Derek McCormack, documents two exhibitions curated by Philip Monk. What It Feels Like for a Girl featured work by Karma Clarke-Davis, Louise Liliefeldt, Peaches (with Kara Blake and j.d. Samson), Fiona Smyth, and Julie Voyce while Sinbad in the Rented World included Toronto queer artists Joel Gibb, Andrew Harwood, Will Munro and Jeremy Laing, Ian Phillips,The Ensemble of Tops 'n' Bottoms, and Scott Treleaven.